ASHA’s Special Interest Group 12, Augmentative and Alternative Communication, published their most recent Perspectives this October and one of the articles caught my eye. 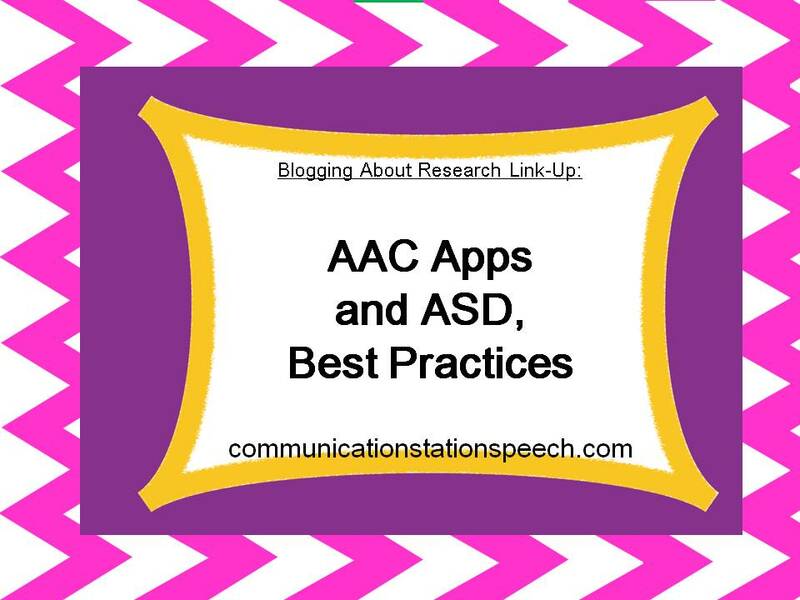 Jane Farrall, a speech language pathologist and consultant in Australia, wrote an an article titled, AAC Apps and ASD: Giving Voice to Good Practice. Although this article is not a research study, it did include a number of important tips and ideas that I felt was worth sharing today. I do feel this information is not exclusive to the ASD population, but rather can be used to determine the appropriate AAC apps for any population or diagnosis if used appropriately. Initially, in this article, Farrall explains how the technology industry and social media have become a large part of typical communication and have begun marketing to populations with communication delays over the past few years. We have parents choosing to purchase iPads and tablets for the sole purpose of using an AAC app as families find these devices more versatile than using voice output AAC devices. Although there are a number of wonderful AAC apps on the market how can we as SLPs determine the appropriate app for our individual clients? Farrall, attempts to provide us as clinicians with some practical resources to do just that. 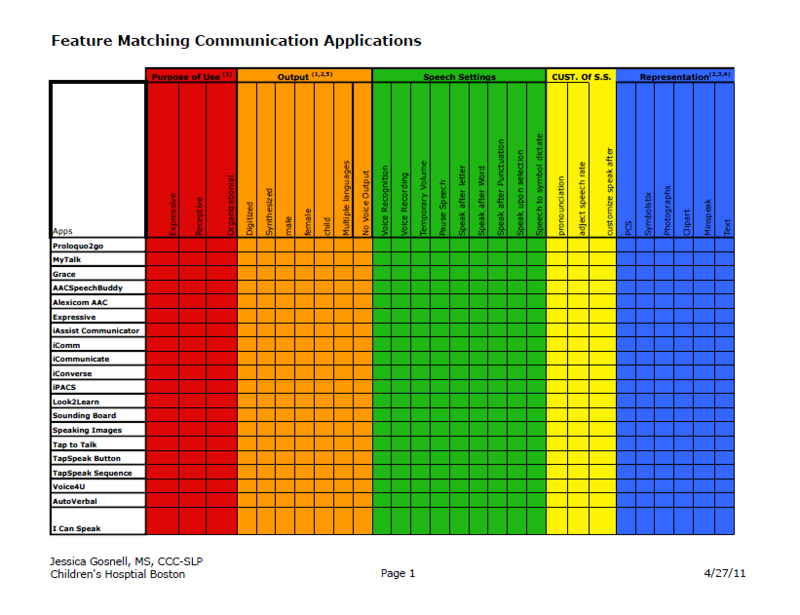 Farrall discusses firstly using Jessica Gosnell’s feature-matching chart for comparing AAC apps. Gosnell suggests that by comparing what features your client needs with the current AAC apps available to your client a number of better AAC app options/choices will become very clear. More specifics on how to USE this chart can be found here. 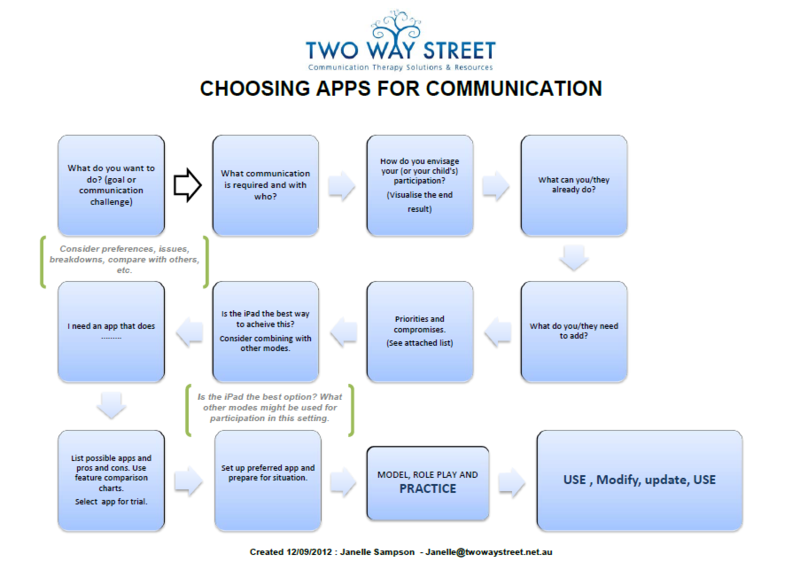 The second process, Farrall discusses in more detail is the use of the Choosing Apps for Communication Flow Chart from Two Way Street. 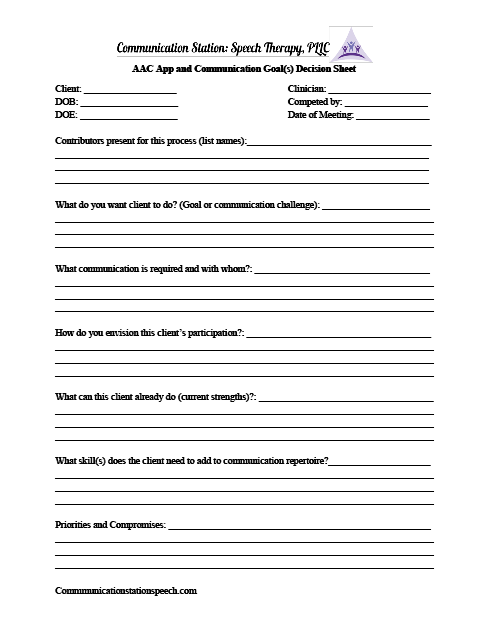 This flow chart provides us as clinicians with a step by step process to evaluating the communication needs of an non-verbal or pre-verbal communicator, determining a vision for that client (keeping parent/family goals in mind as well), understanding the current strengths and needs of each client, determining what features the client’s app must include, choosing an appropriate app and of course modeling and practicing communication. One can see how using this flow chart in a step by step manner, it can be an integral part of multidisciplinary evaluation meetings and yearly IEP meetings. Parents can see how and where current baseline information regarding their child’s strengths and needs are being used to effectively determine functional communication goals. In addition, parents and professionals can also feel empowered by being part of this decision making process via sharing their vision, personal/home/classroom goals, and what they feel are priorities with the entire multidisciplinary team. Farrall closes her article with two case studies and illustrates how she used each step in the above flow chart as a member of school multidisciplinary team to determine the most appropriate AAC app and functional communication goals for each individual student. From Farrall’s examples I made my own form to use in the future when following this process. 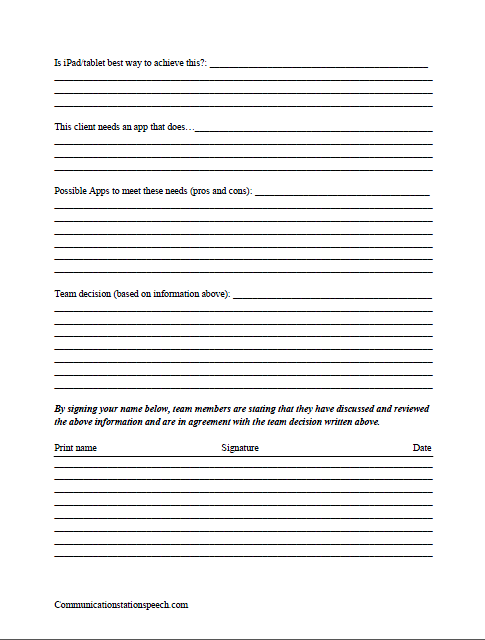 This form should include all members input prior to determining the use of a particular AAC app and communication goals. You can grab it for free here! ← FREEBIE Friday: Fall Past Tense Sentences!